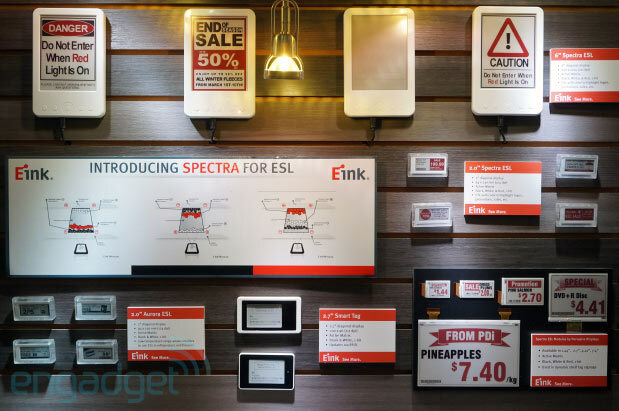 E Ink, the company that makes the screens for electronic book readers like the Kindle or Nook, showed off a new type of display earlier this month that is designed for electronic shelf labels. Picture a grocery store where product price labels are actually tiny E Ink screens, or a conference center where ballroom use signs could be updated instantly, or a clothing store that could have a label next to each mannequin detailing what it was wearing that day. All of these are done with paper labels today, which cost next to nothing, but require someone to physically change each time. Electronic shelf labels are already widely used in other parts of the world, but have yet to catch on in the US. These new displays are the first to offer a color in addition to the traditional black of E Ink. The company also says these are the first digital displays to be able to withstand temperature extremes, meaning these could be used inside freezer cases at a grocery store, for example. I'm sure there's considerable cost involved for a store to deploy signs like this, but I hope we see them used in the US soon.